I apologize for my lack of posts this week…I had a crazy busy work week and was just spent when I got home every night. To make up for that, we post tonight…we post on a Saturday night. As I am enjoying the WBC, I thought what better a time than to tell you about the Pretzel I had while attending a Boston Red Sox game a few weeks back. On our first visit to Jet Blue Park – quite lovely I must say – I had my traditional fare…a pretzel. 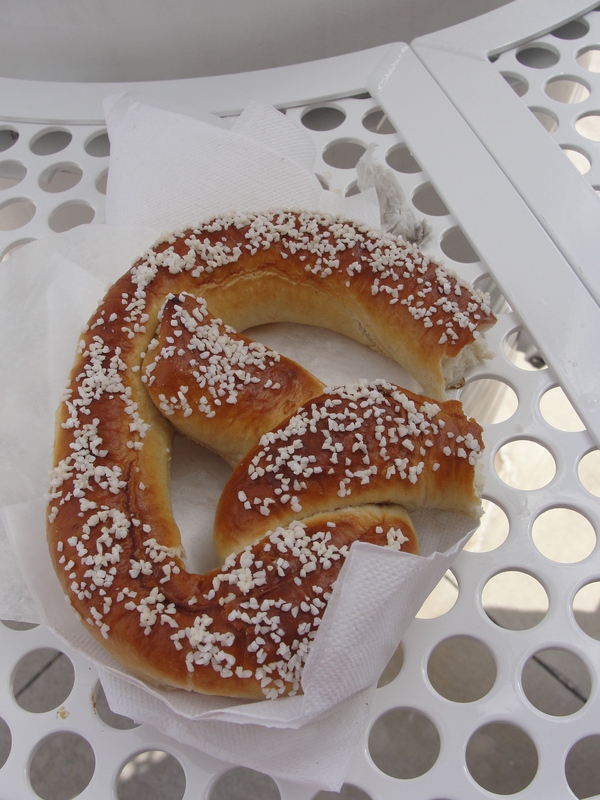 But, unlike your typical soft pretzel, this was a Bavarian Pretzel. And let me just say, Now That’s a Pretzel. We arrived to Jet Blue Park about 35 minutes prior to game time. After walking around and taking in the scenes, I got in the food line. Taylor tried a Fenway Frank and I opted for the pretzel. I saw 2 different pretzels in the case and on the menu board. When I arrived to order, I told the worker I wanted the big pretzel. She told me that was the Bavarian style. Now, I have eaten a lot of soft pretzels in my life but never before have I had one like this. I ate a few bites and then realized I hadn’t taken a photo – my bad. This pretzel was HUGE and was THICK. Like I’m talking double the thickness of a usual pretzel. Plus, the thing was covered in salt. As I broke pieces off, I removed most of the salt. My first few bites, I was in pretzel heaven. 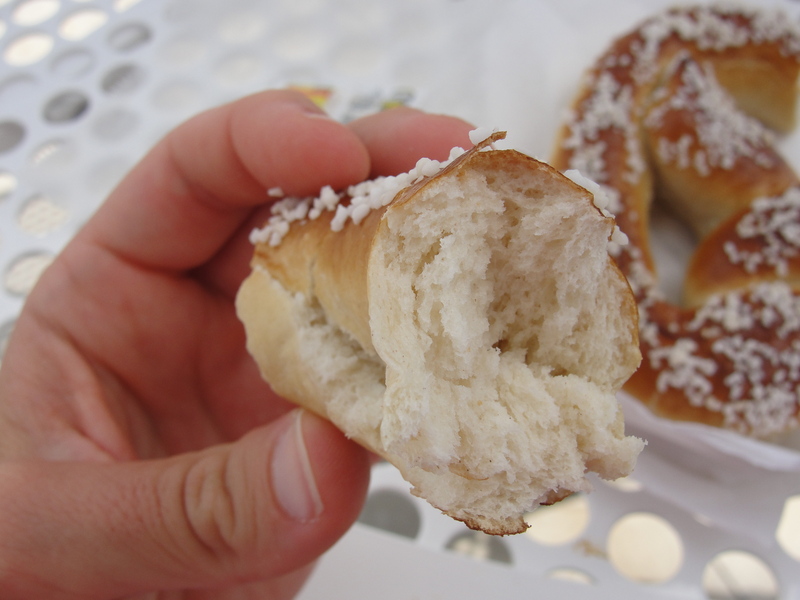 The pretzel was so flavorfull…so soft…so dense. I did find that after a few bites, the thickness of the pretzel really became relevant. I added some yellow mustard to a few bites and ate the rest in 2 bites rather than just 1 bite up-down. This allowed all of the flavors of the pretzel to shine and for me to enjoy it all. Overall, the flavor of the pretzel was rich and delicious. By far, this was the most filling pretzel I have ever had. This is all I ate at the stadium and it kept my full the entire day. I really enjoyed how this pretzel was a step away from the traditional soft pretzel served at a ball game. It made it that much better. There’s not much better in this world than Baseball and Food. Of course this was no Cincinnati Reds game but, we still had a quite enjoyable time. I could watch baseball all day long. The Bavarian Pretzel is a great addition to the usual ballpark fare. At only 50 cents over the price of the usual soft pretzel, this is a steal of a deal. If you are a soft pretzel fan, and are at the stadium, try one of these. Not only will you be impressed with the consistency, flavor and denseness of this pretzel, but you will also be leaving saying Now That’s a Pretzel!